Click to zoom in on part of e symbol. e is the irrational number which represents the base of the natural system of logarithms. 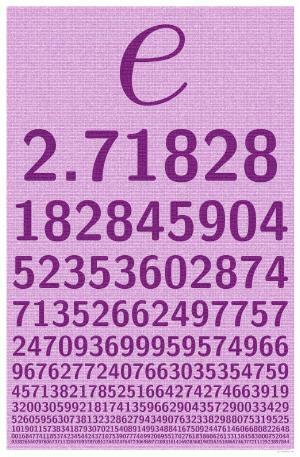 This poster shows the e symbol and the value of e in decimal to many places. Upon closer examination 350,390 digits of e are visible. Each line contains 600 digits of e. The first 440 most commonly recognized digits are visible from a distance. How many lines can you recite? Download source code for this poster. Initial-edition full-size (24"x36") professionally-printed colour poster, 1200dpi on 40lb paper. Price $49.95US plus Shipping & Handling.